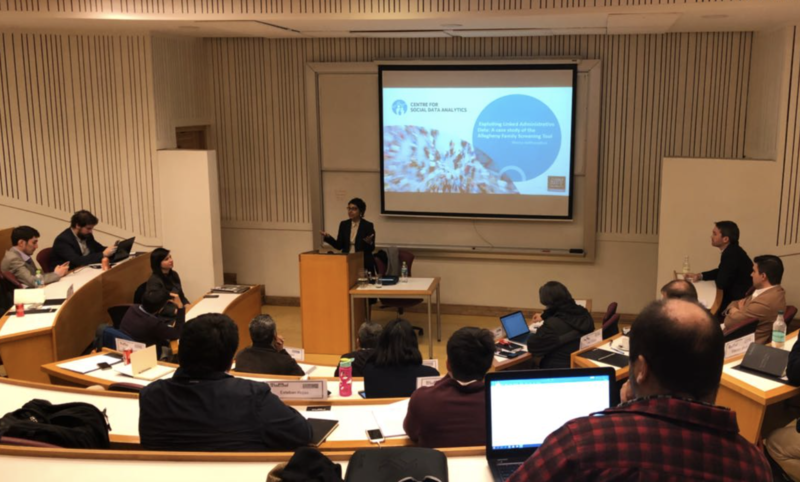 Professor Rhema Vaithianathan, co-director of the Center for Social Data Analytics, recently gave a keynote address on child welfare predictive risk models at the Adolfo Ibáñez University (UAI) in Santiago, Chile. She was invited to Chile by María Paz Hermosilla, the director of the Public Innovation Laboratory (GovLab) at UAI. Rhema, accompanied by CSDA research fellow Diana Benavides Prado, shared her experience in the use of data science to improve the design and management of public policies, specifically those regarding protection of vulnerable children. Maria Paz Hermosilla said the topic was particularly relevant because of the announcement made in March by Chilean President Sebastián Piñera regarding the Great National Agreement for Children that includes among its measures the creation of an early warning system, called "Childhood Alert", with the purpose of being able to identify children at risk in a timely manner. "We were interested in the government taking into account international best practices in this area. I met Rhema at the end of September 2017 at a conference in New York and we invited her to Chile after the announcement was made by the president”. Maria Paz Hermosilla along with the dean of the School of Government at UAI, Ignacio Briones and Rhema Vaithianathan had a series of meetings with professionals from Chile’s Ministry of Social Development - including one with the minister and the undersecretaries of social evaluation, social services and of childhood - to share Rhema’s experience implementing Child Welfare predictive risk models in the United States. Rhema says the visit to Chile was a great opportunity to learn more about a different child welfare system, and to talk about the possibility of Chile using predictive models like those implemented in the United States. "I am very happy to of hear the Ministry’s strong interest in using data analysis to create changes in child protection and improve outcomes for children. I was impressed by the high quality and large amount of data available from government agencies and the degree of support within the community to better protect children from abuse,” she says.